“Stendhal syndrome” refers to rapid heartbeat, dizziness, confusion, and even hallucinations in the presence of great art. It’s named for Stendhal himself, the 19th century French author, who reported experiencing it on an 1817 visit to Florence (and described it in his book Naples and Florence: A Journey from Milan to Reggio). It wasn’t formally described until 1979, when Italian psychiatrist Graziella Magherini documented more than 100 cases among visitors to Florence. The syndrome was first diagnosed in 1982. In the 1840s, John Banvard painted a panorama of the Mississippi River valley — possibly the largest painting ever attempted. It was 12 feet high and 1,300 feet long. He traveled with it through Europe, Asia, and Africa, and Queen Victoria even got a private viewing. 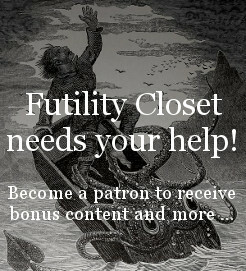 Improbably, it’s been lost. How do you misplace a painting that’s a quarter mile long? 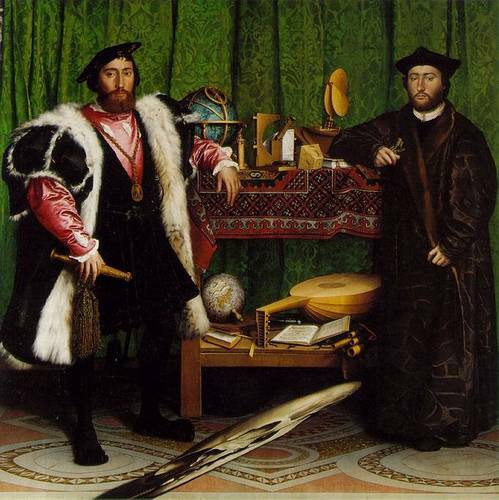 This is The Ambassadors (1533), the celebrated painting by Hans Holbein the Younger. It’s full of noteworthy symbols of exploration, but what’s that odd skewed element at the bottom? This is an early example of anamorphic perspective, an invention of the early Renaissance. 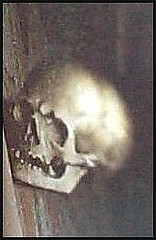 It’s thought that Holbein intended that the painting would be hung in a stairwell, when people ascending the stairs would view the image from the proper angle and get a gruesome surprise. Why? That’s an unanswered question. 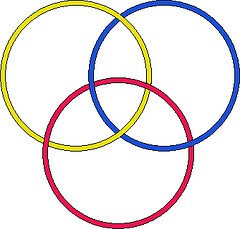 These circles are linked … but no two of them are linked. Americans think of the song “My Country, ‘Tis of Thee” as a patriotic anthem — which is ironic, because everyone else does, too. We stole the tune from the British, who know it as “God Save the Queen,” and the same melody has served as the national anthem of Denmark, Russia, Sweden, Switzerland, Norway, and Liechtenstein. When England met Liechtenstein in a Euro 2004 qualifying football match, they had to play the same music twice. 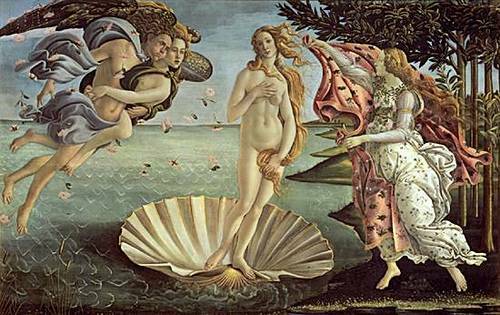 “Intellectual passion dries out sensuality,” wrote Leonardo da Vinci. 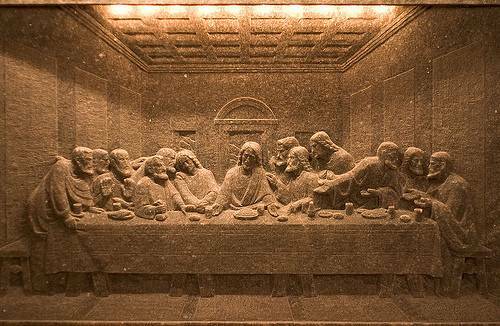 Someone took him literally — and carved this likeness of the Last Supper into the wall of a Polish salt mine. In 1961, Henri Matisse’s painting Le Bateau was accidentally hung upside down in New York’s Museum of Modern Art for 47 days. 116,000 visitors had passed through the gallery before the mistake was discovered. 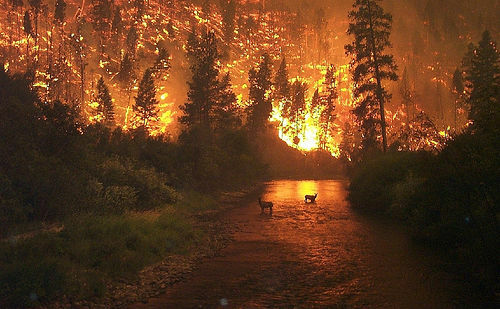 Firefighter John McColgan “just happened to be in the right place at the right time” to take this photo on Aug. 6, 2000, while fighting a 100,000-acre blaze in Montana’s Bitterroot National Forest. He was standing on a bridge over the East Fork of the Bitterroot River, and shot the photo with a Kodak DC280 digital camera.